The Model ABEZ is a horizontal live roller conveyor designed for applications that require accumulation of products without a build-up of line pressure. Singulation feature allows products to be easily removed from any location on conveyor. The EZLogic accumulation modules sense product presence to determine whether a zone should be driving or accumulating. 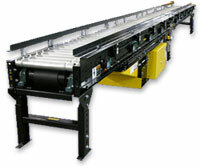 Overall Frame Widths: 18", 20", 22", 24", 26", 28", 30", 34", 36", 40", & 42"
This is an extremely popular systems conveyor. Many factors affect the proper operation of accumulating conveyors such as speed, box weight and box size. Zero pressure conveyor may be either mechanically, pneumatically or electronically operated. Electronically operated units have no minimum weight requirement and do not use sensing rollers. Cartons, totes, fixtures, products with a firm bottom, cylinders and other products within a system.